Stand Up Paddle Surfing: Something on my mind: Prop Fin! Box comes in the mail. Full of fins. Crazy fins, exotic fins, workhorse fins, conventional fins, fiberglass fins, resin fins, carbon/kevlar fins.... all bitchin' but I'm captivated... by the Prop Fin. Thanks Futures guys... drowning me in the fin vortex again. And I happily submit. Photo: Overview. Elevon (Eleven?) 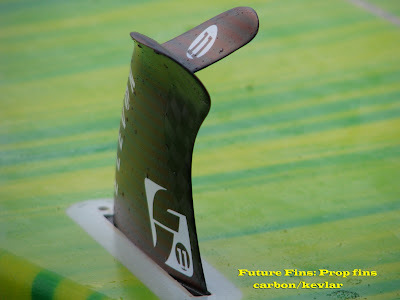 prop fins in carbon/kevlar.... "Don't lend them out, you'll never get them back". Photo: Side/top view. These things have this silky, curvy flow to them- everything blends together. Light as a feather. Photo: How does this fin affect a surfboard? It looks like it might create lift in the tail. Is that good on a stand up board? It looks like it might track along the wave face... do we want that? It looks.... really effing interesting! Can't wait to get it in the water. Photo: So.... I surfed it. I've logged some data points. Damn rains been stinking up the water lately or I'd have it in the water right now- I'd like to see how these go in bigger stuff. Just one session, limited exposure but I've definitely got something to say about these fins... and I will. Soon. Looks similar to the winged keel fins that Cheyne Horan rides. I actually bought one and put it on my board. Awesome in beachbreaks, but a serious "kelp-anchor" @ any break with even a touch of kelp or seagrass. Yep does look that Ben Lexcen winged keel thingy that Cheyne had going on in the 80's.... maybe some of the same ideas going on with it? I'm open to any input you have about them from a hydrodynamic point of view- heck if you'd like to come down to SD and give 'em a shot, let me know! Yep- I think these are going to be out and available soon- made by Futures Fins. Not so much kelp here in SD but I could imagine the snag-factor. Am most impressive by how responsive the fins are... more data to come.